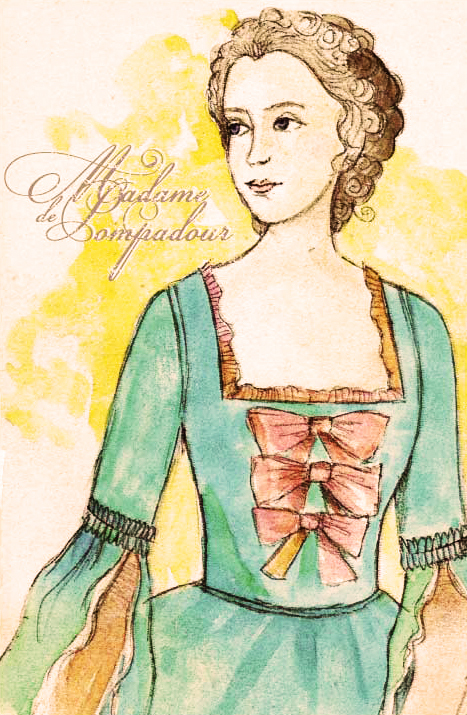 Here we have Jeanne Antoinette Poisson, also known as Madame de Pompadour! (1721-1764). She was the chief mistress of Louis XV from 1745 until she died at the age of 42. Her education was well-rounded in the arts. She was taught her to sing, act, recite plays, and play instruments by private tutors. At the age of 19 she was married to her legal guardian’s nephew- Charles-Guillaume le Normant d’Etoilles. They had two children. She quickly became a popular socialite known for her fashion sense and artsy-ish gatherings of philosophers, including Voltaire. May 1745: She is officially separated from her husband. June 1745: The king gives her en estate, Marquista of Pompadour and her own coat of arms as well as the official title of Marquise de Pompadour. September 1745: She is formally introduced at court. Her road was not an easy one. She was not very popular, but her accomplishments to the arts in France is legendary. She was responsible for factories that produced fine porcelain- and sought out new techniques, she planned large scale building projects, supported artists, sculptors and painters, and patronized the most trend-forward shops to encourage their creativity. She died from tuberculosis in 1764. The King was devastated by the loss.